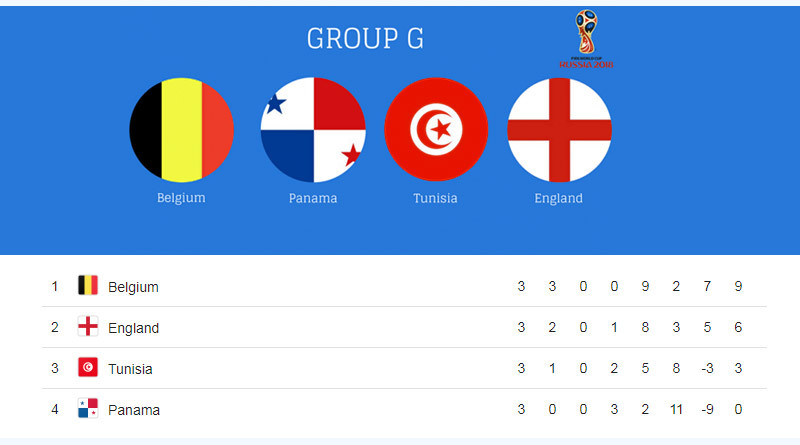 Latest FIFA world cup 2018 group G table and group H table. 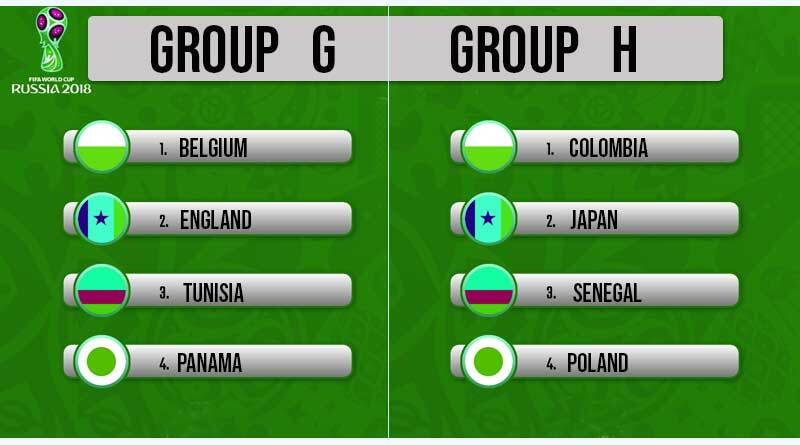 The world cup group stages came to an end on Thursday with Group G and Group H playing out the final set of matches. In a first, a team was knocked out by the fair play rule. Senegal were eliminated after they finished with more yellow cards then Japan; the first time that a team has ever been eliminated in the history of the tournament in this fashion. The rule came into play after both the teams finished on 4 points with the same goal difference as well as the same goals scored and conceded. 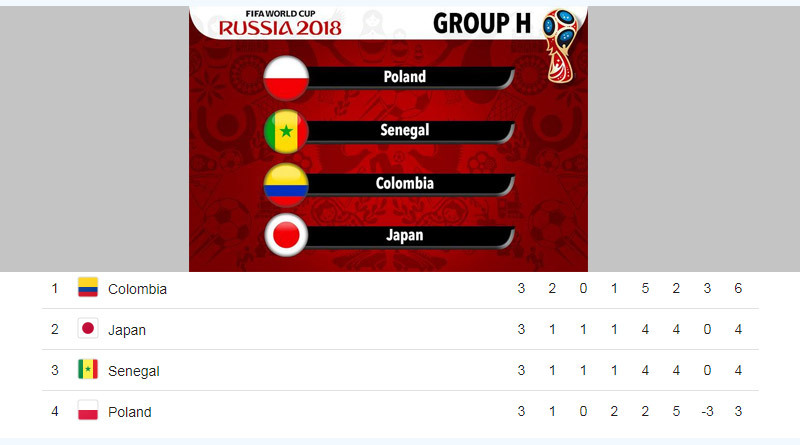 This saw Japan progress to the round of 16 along with Senegal from Group H while England and Belgium completed the set by progressing from Group G.
Group H was the first group that played yesterday with lot many permutations and combinations possible in the group. With three teams still fighting for qualification to the next round, both the matches of the day were tightly contested, decided by 1 goal margins in the end. With news filtering in from Japan V. Poland of Poland taking the lead with a Bednarek strike, the group completely changed on its head. A Japan side that were so sure of making the knockout stages that they had made 7 changes to their staring line-up were suddenly on the verge of being knocked out from the world cup. The result gave Senegal more impetus to hang onto their 0-0 scoreline in their match against Colombia. Their hopes were however crushed in the 71st minute after Yerry Mina scored for Colombia to put Senegal on the brink of an exit. Both the matches ultimately ended with the same scorelines to send Senegal packing from the cup on the fair play rule. The result meant that no African side has made the round of 16 this time around, a big blow for football in the continent. One of the most anticipated matches of the group stages turned into a very drab affair with England and Belgium playing out a boring draw. Both the sides played their b teams after qualification was already guaranteed for them in the last round. With the runner-up of the group avoiding Brazil or Mexico in the quarter-finals and facing weaker teams till the final, it almost looked as if both the sides wanted to lose. A farce of an England V. Belgium match saw both the teams pass the ball around meaninglessly, with no side taking it upon them to score. The most poor first half of football this year was greeted by boos from the supporters and did wake the players into making the second one a bit better. The match was ultimately decided by a Janujaz strike that saw Belgium top their group. The second match of the group saw Tunisia get their first points at the world cup in 40 years with a 2-1 win over Panama.